How do you reset oil service light Ford Explorer Sport Trac. From years: 1999, 2000, 2001. How do you reset oil service light Ford Explorer Sport Trac. From years: 2008, 2009, 2010. All information is taken from the Ford Explorer Sport Trac owners manual. That it is the full procedure how to reset oil service light Ford Explorer Sport Trac. If you like to reset any maintenance oil light after an oil change. Or reset check engine light, airbag light, inspection key or insp errors when maint reqd, for Ford cars. Or any warning light for service reminder which appears on the display. Write in the search box the car name for which you want to find information, and find how to reset other service reminders when by yourself. Click hear to see full procedure how do you reset the oil light indicator. 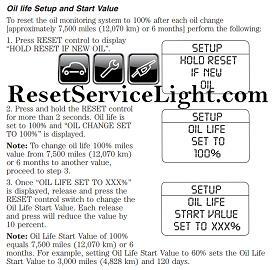 How to reset the maintenance light and how do you reset service light for all Ford vehicles. Reset change oil light on 2009 Explorer Limited. Hello Daniel I do not understand, how can I help you? Where is the set up control on my 2008Ford-Sport Trac. I can not get the Park Aid light off. Is there a fuse that not be working properly? THANKYOU for your help. Hello Joyce, please tell me what car do you have ?